Force on force training is where the rubber meets the road. You'll be pitted against thinking adversaries in likely real world scenarios. Using Airsoft pistols, you'll learn what tactics work and what tactics don't. This curriculum is designed for serious students who are willing to take the next step in the training continuum. Home protection scenarios are now emphasized. Long sleeve T shirt or sweat shirt; no body armour. 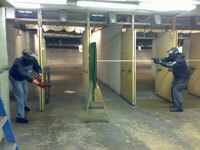 Basic / Intermediate Handgun or instructor's permission.